Pour tequila into a salted glass with ice. Add the Worcestershire sauce, Tabasco sauce and lime juice. 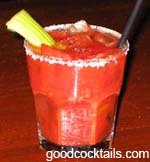 Fill the glass with tomato juice or Bloody Mary mix. Use celery salt if available. You may add some pepper.